Castle Park - the Riverside theme park and miniature golf course - turns into the Castle Dark Halloween haunt when darkness falls during October. On top of the carousels, log rides and other amusements, park-goers can take advantage of such seasonally themed attractions as Ghost Blaster POV ride and Ghost Mansion virtual reality experience (reviewed here). Castle Dark also features a trio of Halloween-themed mazes. Carnival of “S”Laughter starts as you enter a clown’s mouth. The sets and the actors suggest a fun house gone horribly wrong. Castle Peak Caverns follows immediately after the Carnival of “S”Laughter. A staff member directs you when you exit the first maze. You then find yourself walking towards an abandoned cavern. The story on the Castle Park website tells us that the Norton family was buried alive in the 1950s during a violent conflict with the government, which used this site to store nuclear waste. The Norton family ignored the keep-out signs because they hoped to mine gold. As you descend into this cavern on a creepy narrow pathway, you may encounter the family doing what they can to protect their riches. You’ve been forewarned! 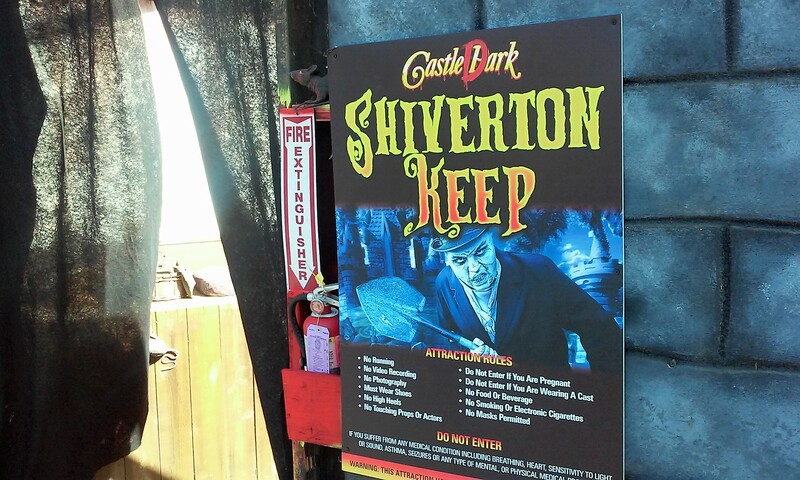 Shiverton Keep: After Castle Peak Caverns, the exit brings you toward this maze, which is located in Castle Park's Buccaneer Cove. Word is that the sorceress Mal Drogia cast a spell over this Kingdom and unleashed a deadly plague. Centuries have passed, and the air has cleared, so there should be nothing deadly about this castle. The interior, rich with props, suggests there is still something living inside. As it turns out, the residents of Shiverton Keep never made it out. At each dark corner, you will encounter Shiverton’s doomed citizens. As you encounter each pathway, there may be multiple openings; the residents direct you if necessary - almost as if they want to show you the way out for trespassing on their sacred ground. If you are able to sneak through unscathed, then consider yourself lucky. Castle Dark could be easier to navigate. Signs pointed to some Halloween attractions but not all. There are no Castle Dark night-time maps, so visitors have to find their own way. Our suggestion is to start with Carnival of “S”laughter just past the Carousel, which leads to the Castle Peak Caverns. From there, hook a right and enter the Arcade area for Ghost Blasters in 3-D. Finally, exit the Arcade and follow signage to Shiverton Keep in Buccaneer Cove. If you paid the $5 surcharge for Ghost Manor VR, that’s located on the way out in the front behind the Carousel. We suggest saving this one for last. Castle Dark suggests a cross between a miniature Six Flags Magic Mountain Fright Fest and the Knotts Berry Farm Halloween Haunt. The decor and rides remind us of Knott’s (no surprise since Castle Park's creator worked at Knott's), but you get a single price admission experience like Six Flags Fright Fest, which allows you to enjoy the daytime park and nighttime Halloween offerings at a flat rate. Castle Dark admission can range anywhere from about 9.99 to 19.99 depending on what day the tickets are ordered; there are advanced discounts, calculated by how many days ahead you bought the ticket. Though the mazes are shorter and simpler than those at other haunts, you really can’t beat Castle Dark for the price. 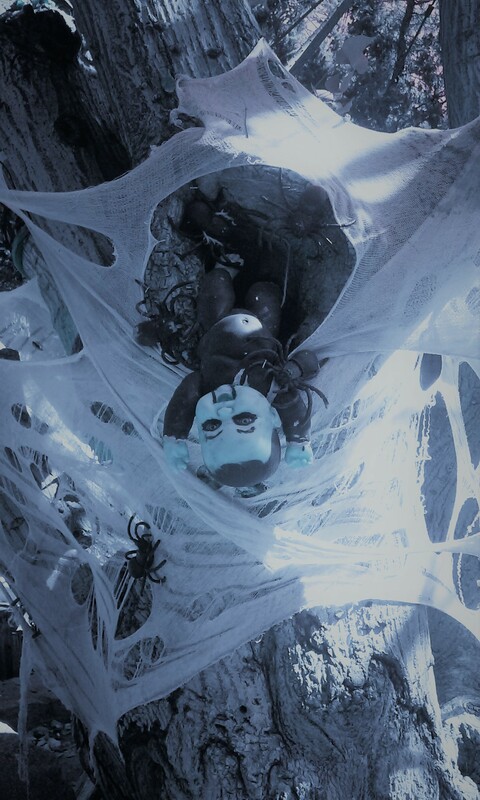 Castle Park also presents Happy Hauntings on Saturday and Sunday afternoons in October, including a kid-friendly House of Halloween maze, which is closed during Castle Dark's evening hours. Castle Dark continues at Castle Park on October 20-22, 27-29. The address is 3500 Polk Street, Riverside, CA 92505. The website is: castlepark.com/castledark. A miniature combo of Six Flags Magic Mountain Fright Fest and the Knotts Berry Farm Halloween Haunt, you can’t beat Castle Dark’s single-price admission for daytime fun and nighttime Halloween horror. Find more Halloween Theme Parks in A Halloween Haunts Master List.